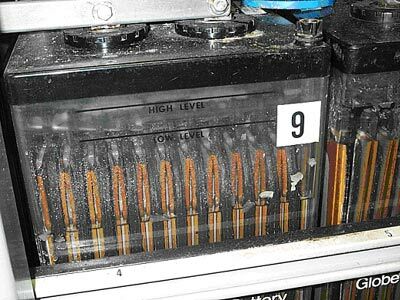 During normal operation, water is lost from a flooded lead-acid battery as a result of evaporation and electrolysis into hydrogen and oxygen, which escape into the atmosphere. One Faraday of overcharge will result in a loss of about 18 g of water per cell. Evaporation is a relatively small part of the loss except in very hot, dry climates. With a fully charged battery, electrolysis consumes water at a rate of 0.336 cm^3 per cell per ampere-hour of overcharge. A 5000-Ah battery overcharged 10% can thus lose 16.8 cm^3, or about 0.3%, of its water each cycle. It is important that the electrolyte be maintained at the proper level in the battery. The electrolyte not only serves as the ionic conductor, but also is a major factor in the transfer of heat from the plates. If the electrolyte is below the plate level, then an area of the plate is not electrochemically active; this causes a concentration of heat in other parts of the battery and “Sulfation” of the dry portion of the plates which may not be reversible. Periodic checking of water consumption can also serve as a rough check on charging efficiency and may warn when adjustment of the charger is required. Since replacing water can be a major significant maintenance cost, water loss can be effectively reduced by controlling the amount of overcharge and by using hydrogen and oxygen recombining devices in each cell where possible. Note that these devices can overheat and cause battery damage if the battery is charged at a high rate. Read specifications carefully, the expensive “Caps” may need to be replaced before the end of battery life. Addition of water is best accomplished after recharge and before an equalization charge. Water is added only at the end of the charge to reach the high level line. Electrolyte expands as the battery is charged significantly increasing in volume. Therefore overfilling must be avoided because the resultant overflow of acid electrolyte will cause tray corrosion, ground paths, and loss of cell capacity. Gassing during overcharge will stir the water into the acid uniformly. In freezing weather, water should not be added without mixing as it may freeze before gassing occurs. Only distilled water should be added to batteries. Although demineralized or tap water may be approved for some batteries, the low cost of distilled water makes it the best choice. Automatic watering devices and reliability testing can reduce maintenance labor costs further. Although distilled water is no longer specified by most battery manufacturers, good quality water, low in minerals and heavy metal ions such as iron, will help prolong battery life.